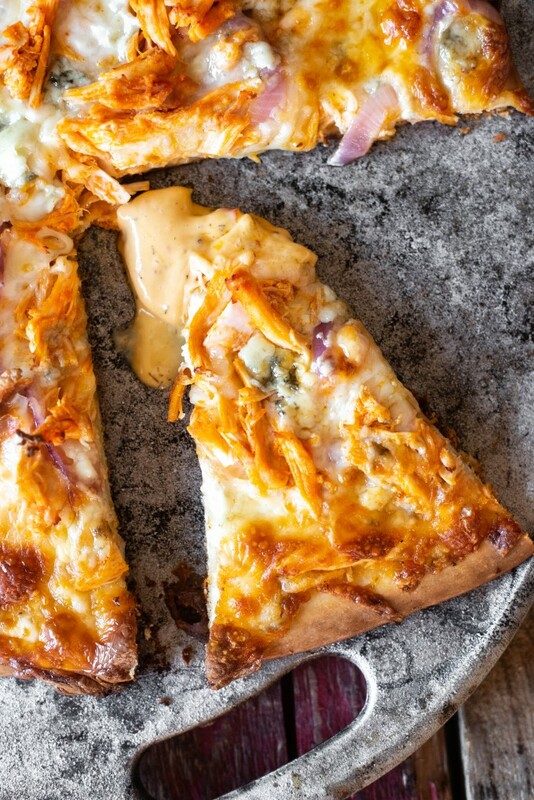 Skip the take out and bake your own Buffalo Chicken Pizza at home! Packed with that fantastic buffalo flavor that we all know and love, it gets an added punch from an unexpected ingredient. 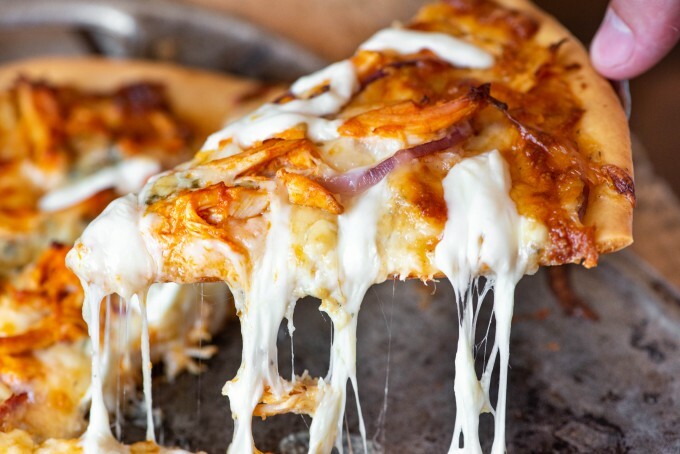 Easy to use with leftover chicken or shredded rotisserie chicken, this cheesy pizza is a guaranteed family favorite! 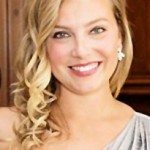 This post done in partnership with Sir Kensington’s. All opinions, as always, are my own. If there’s one thing that I’ve figured out about my husband, his sister, and her husband, it’s that I know I can put down just about anything with the word “buffalo” in it, and they’re all in on it. Whether its wings, dip, or sandwiches, those three just can’t get enough of that flavor profile. I mean, we went out to dinner last night and put away two orders of buffalo fries. FRIES! I mean, what can’t be buffalo flavored? Well, as of recent, I can tell you that the seemingly official condiment of the Midwest can- ranch dressing. You’re all aware of my year long love affair with Sir Kensington’s condiments, so I was unbelievably jazzed when I found out that they were coming out with a line of ranches, including a buffalo version. Yes, you read that. Buffalo. Flavored. Ranch. I have to admit, I was a little skeptical when I first opened the box that contained their whole new line (classic made with sunflower, classic made with avocado oil and a hint of lime, pizza, and buffalo!). However, my sister in law was immediately intrigued. 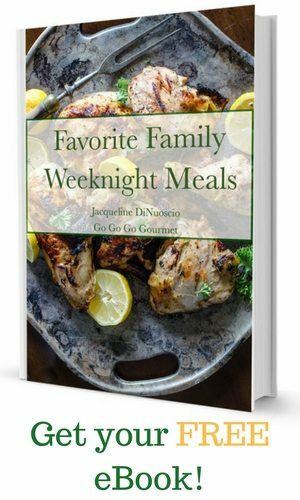 It was one of those nights where you don’t really expect to get together, so a dinner plan just got sort of cobbled together. I had some avocado fries in the freezer, and thought that the buffalo ranch would be the perfect dipper for it. One taste and we were all completely obsessed with this. Its buffalo-y without losing the ranch flavor, and is still sort of on the light-tasting side (especially for a ranch!). It was totally amazing. 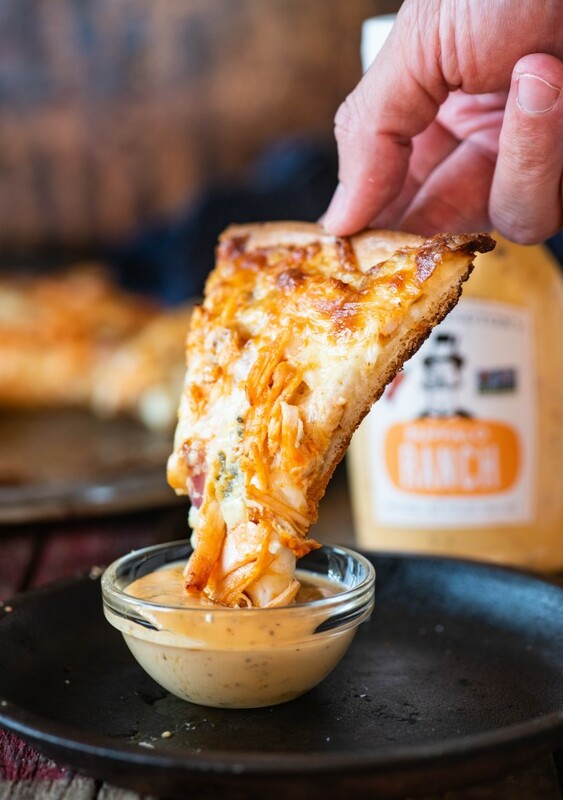 I really wanted to use it to make a buffalo chicken pizza recipe, and decided to use it both as the sauce for the pizza as well as for dipping. I was initially a little hesitant as to how it was going to go over, but after the first bite, I knew I had hit a home run. If Sir Kensington’s Ranch lines aren’t available near you, you can find Sir Kensington’s Ranch and their full line of condiments here– or find out where to purchase them near you. I recommend using something to get your crust nice and crispy. I’m always a fan of using a pizza stone, as I think it is the superior option, but you can also use a pizza crisper (basically a round tray with holes in it) or a baking sheet.. These are listed in my order of preference. If you use a cookie sheet, I recommend using a rimless one for space and cutting purposes. Make easy work of shredding your chicken- throw the chicken in a medium sized mixing bow, and use your hand mixer on low to break it up for you in no time flat! 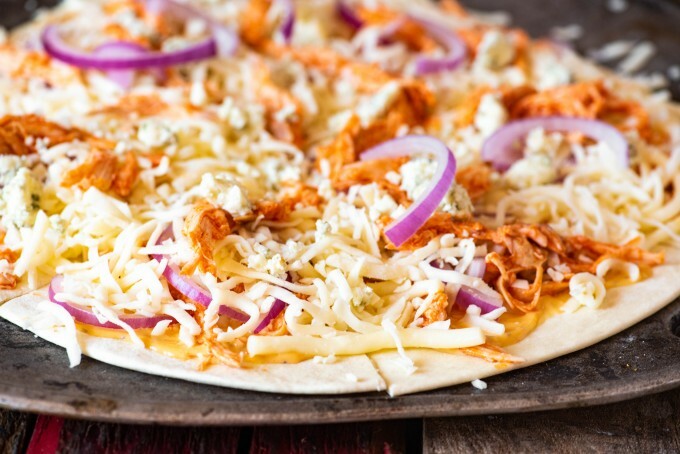 If you like Buffalo Chicken Pizza, make sure that you check these out too! Place the shredded chicken in a medium sized mixing bowl. Pour the buffalo sauce over top, then stir until chicken is evenly coated. Place the pizza crust on a baking sheet or pizza stone. Spread the Sir Kensington's Buffalo Ranch over the surface of the pizza crust, leaving approximately 3/4" border from the edge. 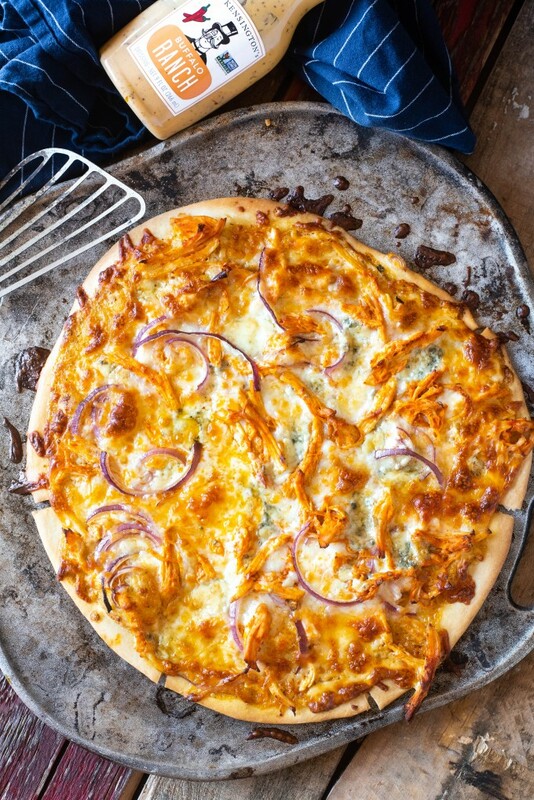 Scatter approximately 2/3 of the buffalo chicken over the pizza, followed by the onion. Sprinkle with both cheeses, then the remainder of the chicken. Bake in preheated oven on the middle rack for 12-15 minutes, until crust is golden and the cheese is melted and lightly browned. woah that was a hit in my house! What a pizza! !